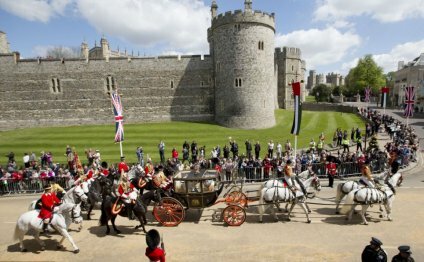 To make the most of your time at Windsor, pick up one of the free multimedia tours in the Courtyard at the start of your visit. Available in English, French, German, Spanish, Italian, Japanese, Brazilian Portuguese, Russian and Mandarin. The tour is introduced by The Prince of Wales, Chairman of the Royal Collection Trust and takes you through the Castle Precincts, the State Apartments and St George’s Chapel. The commentary provides a lively guide to the Castle’s history, from William the Conqueror, through medieval expansion, George IV’s gothic transformation and The Queen’s use of the Castle today. Along the route, staff of the Royal Household explain the role of the Castle today as an official residence of The Queen and talk about their work, from arranging a State Banquet for 160 guests to restoring the historic interiors following the devastating fire of 1992. Woven into the tour are the unique sounds of the Castle, from the music of St George’s Chapel choir to the chimes of the famous collection of clocks. Collect your handset and listen to Horace, a timeless tutor, and Tommy, his pupil, who are your guides. They introduce you to the many magical characters who live at Windsor Castle, including Gilbert the Grotesque and Cyril, a Page of the Back Stairs. The tour is rich in description, giving you a sense of the size and scale of the Castle, the decoration of the rooms and the texture of materials and furnishings. Royal Collection curators highlight some of the greatest and most popular works in the Royal Collection, including works by Pieter Bruegel the Elder, Holbein and Van Dyck. In St George’s Chapel, you are encouraged to touch architectural details. Lady Albertha Frances Anne Hamilton Spencer-Churchill, VA (29 July 1847 – 7 January 1932), was an English aristocrat. She was the daughter of James Hamilton, 1st Duke of Abercorn and Lady Louisa Jane Russell.